In 1934 several doctors who were attending a British Medical Association meeting in Brighton held a successful exhibition of their own art works. This led to the foundation of the Medical Art Society in 1935 for doctor-artists who paid an annual subscription of one guinea a year. Sir Leonard Hill became the first President and other distinguished medical men on the Committee included Geoffrey Bourne and Sir Harold Gillies. (No women doctors were members until 1951). It was decided to hold an Annual Exhibition every year of drawings, paintings, etchings, woodcarvings and sculptures by the members, and this would be followed by an Annual Dinner. In 1938 membership of the new MAS had risen to 85 and at the Annual Exhibition, held that year at the Royal Society of Medicine, 38 paintings, 57 drawings and four sculptures were shown. During World War II the Society remained dormant but in 1947 it was restarted and 148 works were shown at the Annual Exhibition. Other activities over succeeding years included winter drawing classes and critiques by distinguished artists and the Exhibitions continued to be successful despite growing financial problems and a drop in membership. In 1967 dental surgeons were invited to join the Society and over the next decade activities were more limited but there was an Exhibition nearly every year and links with similar societies abroad were developed. Since then works by Danish, French and Dutch artists have been shown on occasion and MAS members have also been involved in similar exhibitions abroad. The Society was fortunate enough to be rescued financially in 1977 by a distinguished member, the Baron ver Heyden de Lancey, who was qualified in medicine, dentistry and law and keen to promote interaction between the different disciplines as well as being an art collector and amateur painter. He thought that the Medical Art Society should be closely linked to the Royal Society of Medicine and to that end left generous annual sums in perpetuity to the RSM for the administration of MAS affairs, and to the MAS for general expenses and for two prizes to be awarded at each Annual Exhibition. His generosity meant that the Society was on a sound financial footing again and membership rose. 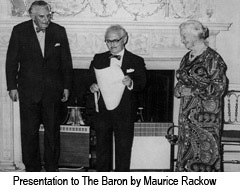 The Baron was invited to become the Society's first Patron, followed after his death by Sir Hugh Casson. The present Patron is the distinguished artist, Mr Tom Coates. In 1995 the RSM opted out of the agreement to provide administerial support and MAS members took on these tasks until 1998 when the RSM again became the 'home base'. In that same year Professor Victor Dubowitz organised an excellent symposium on 'Medicine and the Arts' at the RSM and the Annual Exhibition and Dinner were both held there. Venues for the Exhibitions have varied over the years, being held originally in the RSM but subsequently at the following: Fine Art Society Gallery, Walker Gallery, Leighton House, Chandos House, Archer Gallery, Royal Free Hospital, Westminster Gallery, Royal London Hospital, Royal College of Pathologists and, from 1980 to 1987 and from 2000 to 2008 at the Mall Galleries. In 2009 for the first time the Annual Exhibition was held outside central London, at the Artshed, near Ware.